The nineteenth century English landscape painter Joseph Mallord William Turner (1775-1851) purportedly tied himself to the mast of a ship during a violent storm to experience the tempestuous power of the sea first hand—all this so that he could more persuasively represent the expressionistic, impassioned seascapes he was renowned for painting and exhibiting at the Royal Academy in London; indeed, it has been reported that viewers of his works would come away seasick, so convincing were these representations. While the first account has widely been debunked as self-aggrandizing myth, these dramatic anecdotes nevertheless capture the sentiment succinctly stated by French Impressionist Paul Cézanne: “Painting from nature is not copying the object, it is realizing sensations.” Like Turner, who was initially trained in architectural and topographical drawings before creating the experimental canvases he became known for, Philadelphia-based artist Rebecca Rutstein is inspired by concrete concepts, but her abstract paintings, sculptures and installations depart from real-world associations to become immersive depictions of ephemeral concepts, intangible ideas and emotional states. In July of 2015, Rutstein was invited aboard the Nautilus exploration vessel as it traveled from the Galapagos Islands to California, with the mission of creating sonar maps of the ocean floor. The following summer, in 2016, Rutstein embarked upon the oceanic research vessel Falkor as it journeyed from Southern Vietnam to Guam collecting satellite information. Much has been written about Rutstein’s involvement with the science and research community, but the artist’s role is more about revealing the shades of gray than dealing in black and white discoverable facts. Cumulonimbus (2014), awash in layers of transparent shades of gray, is a fictive landscape, an imaginary swirl of sea, sky and everything inbetween. Juxtaposed against this inexact background are cloudlike masses made up of a network of precise tetrahedral forms. Rutstein explains of her recent work, “I used to have more of a reference point, but then the viewer couldn’t get lost.” Getting “lost”: this the sensation of the Sublime that Romantic landscape painters like Turner, Caspar David Friedrich, John Constable and others sought after; the most powerful of responses that only a picture of the mysteries of the majestic natural world could elicit. For Sky Terrain (2015), Rutstein excised the tetrahedral, billowing motif from Cumulonimbus and rendered them by hand before inputting her drawings into a special computer program that then translates the information to laser cut steel sheets. The steel sheets are at once delicate yet sturdy, with their dense scheme of cutaways, they both occlude and reveal. Standing aloft without the use of exterior props or anchors and curving into each other, the sum of the sculptures amounts to an independent orbit and system, just as the oceans and landmasses will continue to rise and fall with or without humankind. Rutstein created Galapagos II (2016) after her return from the Nautilus. Against the swirl and vortex of layered turquoise paint —a paint pouring technique perfected by happenstance during studio sessions amidst rough seas as the Nautilus trailed Hurricane Dolores—an intriguing web of lines soars up and across the canvas in peaks and valleys. 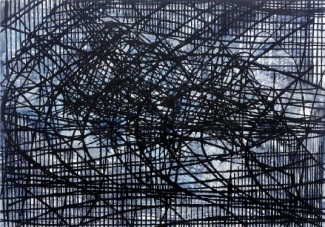 Similar to the manner in which American painter and draftsman Terry Winters adopts the organizational principles of biological processes and scientific and natural phenomena to devise new systems in his line-heavy paintings and drawings, Rutstein relies on the line to delineate the indiscernible and the inexplicable. These lines reveal the sea floor many leagues below, but, as they break away, trail off, and soar past, they also remind us of how little we know, and, possibly, how the terrain might change before we are even able to grasp and map it. It seems that for all of our scientific and technological advances, the sea maintains its place as a coy muse, shrouded in mystery. With her unique background and experience on board the Nautilus and the Falkor, Rutstein brought back reports not of measurable figures, but paintings and sculptures that give form to the nebulous enigma of the sea and its terrain, inspiring and propelling the scientific community and general public with visual poetry and portraits of the Sublime. JENNIFER S. LI is the LA Desk Editor for ArtAsiaPacific and a regular contributor to publications including Art in America, Sight Unseen,and Art Review. My work expands upon my interest in geology, maps and the undercurrents that continually shape and reshape our world. These forces – from gradual erosion to violent upheaval – are powerful metaphors for life experiences and the ebbs and flows of relationships. My paintings become mappings where scale is shifted and obscured, articulating fractal patterns found in nature. I construct spaces through juxtapositions: micro and macro, graphic and atmospheric, organic and geometric, positive and negative, manual and mechanical, linear and solid. I am continually challenged by creating environments that bridge these polarities. In 2015, I had the opportunity to sail with scientists aboard the Nautilus Exploration Vessel from the Galapagos Islands to California. During our transit, we used the ship's multibeam sonar technology to create hi resolution mapping of the ocean floor beneath us. This once in a lifetime opportunity allowed me to work with never before-seen ocean floor topography and capture these submarine terrains into paintings that I created in the wet lab of the ship. I started by pouring paint and letting it disperse in response to the rocking motion of the ship. This process-oriented foundation became a record of the ship's movement, and a counterpoint to the more delineated mapping grids overlaying them. The software we used enabled me to "fly" through the data and find compelling vantage points of the submarine landscape, then superimpose them into the paintings. The painting, Galapagos II, created back in my Philadelphia studio, was inspired by these works created at sea.